This much we know: Zion I’s formula for crafting indelible underground hits for the past decade has cemented emcee Zumbi and DJ/ producer AmpLive—collectively Zion I—as elder statesmen in Bay Area hip hop. Zumbi’s raw poetics back dropped to AmpLive’s pounding, jazz-electro soulscapes are noted up and down the entire coast. 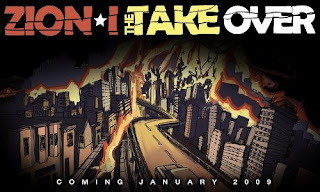 Zion I’s sixth studio album, The Take Over (Gold Dust), however, teeters between political rap and pop, underground and mainstream. Translation: The Take Over is an industry experiment in sonic fusion, and by album’s end Zion I create a sound all its own—progressive power-pop. Zion I die hards will not be disappointed as the fundamentals-the socio-political message, futuristic tracks, glass half full authenticity, and second to none mash ups (See Radiohead In Rainbows Remix project, DL gratis here) remain intact. The Bay area's perplexing duo continues to shine because of its insatiable drive to innovate. The poppier Take Over will surely attract new listeners to Zion I's deserving collection.